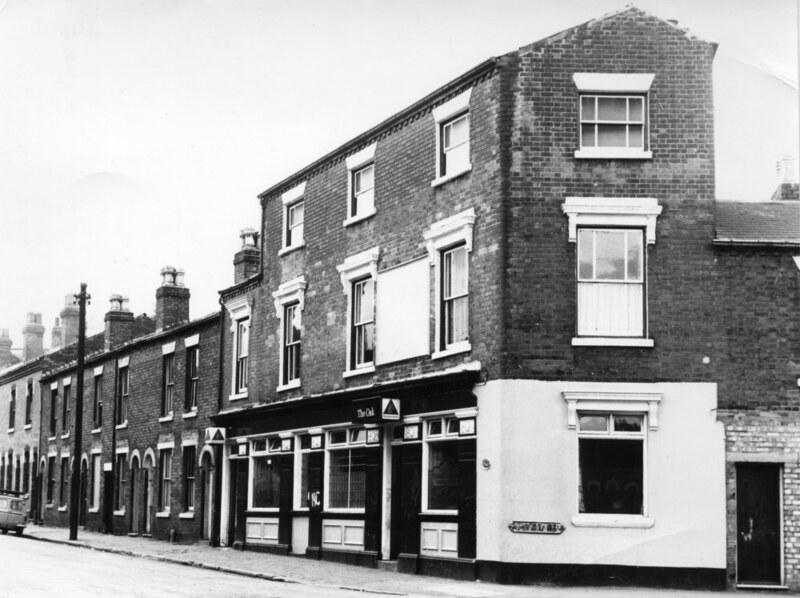 "SIR ROBERT PEEL" PUBLIC HOUSE---PEEL STREET----1972 just before the old houses were demolished. PEEL STREET 16/01/2017 HOUSE OF FEAR This photo was taken by the Birmingham Mail in the mid sixties, the headline read house of fear. No 68 Peel st, the Plunkett family from left to right Michael sitting on the barrier ,Danny, mom Eileen, holding my sister Maggie, and me Peter Plunkett. PEEL STREET 19/12/2017 Hello..I was born in 1962 and lived in a Peel Street with my parents Marguerite and Barry Kynaston and their parents Jack and Lilian Harrison.We moved to Sutton Coldfield sometime before I was 5. My Mum and Nan are on the VE celebration photo (Lower down on this page) my Mom would be about 11 then, she is the one with a mass of long curly hair (red hair). PEEL STREET 24/07/2017 REMEMBER WHERE WE CAME FROM. It is with great sadness that I write this email... You kindly posted my message on your lovely Peel Street page back in March of this year (2017) for which I was truly greatfull. Unfortunately I have learnt that it is probably best not to look back and open ones self up to being contacted by others that also have there memories of Peel Street. I have been talking to a person who lived in our street and at first the chats where about memories but I have found as time has gone on the talk became more about this persons family and how well they have done, it's as if there is something to prove that even if we came from Peel Street it is possible to be successful. Don't get me wrong I'm more than pleased for anyone who has made a great life for themselves but I feel it's worth mentioning that we are only who we are now because of where we come from. I remember this family back in the old days and my memory tells me that even back then they felt themselves better than the rest of us. I would like to say the parents of this person I have been talking too were a lovely couple and helped me as a child but their son has turned out to be a total snob... I will leave it there and you are welcome to post this email on your site it may help other from the street to remember where we came from and we don't need to be impressed. I do think we who came from Peel Street can see when people are trying to prove how well they have done since leaving the street but no matter how successful they have become they still came from our street and nothing can change that. Once again thank you for your lovely site it has been a great help to me. Kathleen kathleenwells123@gmail.com. PEEL STREET 12/01/2016 I used to live in 27 Peel street in 1964 approx. until we moved to Stechford late 60s would like to know have you anyone wanting to contact the family named Wood my mother name was Mary Wood any help would be grateful. I have just been looking at your Internet site, and there is a photograph on there from Frank Thornton 15/09/06. He is looking for the name of a lad on the photo, this is my brother Colin Talbot . We lived at 89 Peel Street my dad Bill used to work in the Sir Robert Peel pub to subsidise his wages for our holidays, mums name is Nancy & at 91 she is still going strong. Colin is the eldest, followed by Keith then myself and younger sister Glenys. My grampy also lived with us Francis John Baker, he always had a bag of sweets in his pockets for all the kids in the street, he was a well loved person on the street. We all went to foundry road school then my brothers went on to Handsworth New Road. We had an aunt & uncle Elizabeth & Jack Haywood & son John who sadly are no longer with us who lived halfway down Spring Hill opposite a pub I can't remember the name. Another aunt & uncle Lena & Ivor who also sadly are not with us any more and sons David & Victor who lived further on down the road aunt Lena used to play the organ in the nearby baptist church. I noticed your wonderful website and wondered if you can help me, I'm looking for a man name Patrick Reid (unsure of the exact spelling of the surname) who lived in peel street in 1963/64 probably longer but that is all i am aware of. If any one has any information at all i'd be more than greatful if some one could contact me. THANK YOU. katrinatoyne@hotmail.co.uk . I have just found your site. Its great seeing all the old photo's. I am researching my family tree and my gt gt gt grandfather owned houses in Peel Street. My gt grandfather was born there in Wardell Buildings. Has anyone ever heard of them? There were seven houses altogether. Does anyone still use telegrams? Just came across this photo it shows my mum Edith Field and Uncle Les (dad's brother) who lived at 84 Peel Street, sitting on my first motorbike, a James Captain, in the back garden at 112 Peel Street. This would be 1959 as I can see the bike still has 'L' plates on and I passed my test early in 1960. I bought the bike from Cope's Motorcycles on Hagley Road, near the King's Head, and they gave free lessons on their track, somewhere near Barnes Hill if I remember correctly, on BSA Bantams which they provided. The trouble was you had to ride there first, a complete novice and on public roads. I stopped going when I was told off for going too fast!!! The houses in the background are one of the terraces that came in from Lansdowne Street, which would be on the right hand side of this photo. Sadly my mother Edith Field passed away on 16th September 2009 in a care home, aged 90yrs. We used this wedding photograph on the Order of Service at her funeral (Dad passed away in 2006, aged 93yrs). I had often wondered why the wedding photos were taken in Peel Street and not at St Cuthberts Church, but found out while talking to her sister at the funeral. The photographs were taken at St Cuthberts originally, on a very old camera using glass plates (this was in 1938 remember). Unfortunately, on his way home the photographer tripped over, dropped them and of course they shattered. He then had to hotfoot it round to Peel Street where the wedding celebrations were well under way, explain what had happened and ask everyone to please change back into their finery so he could take some more. These were taken in the yard at the side of 69 Peel Street and the shop in the background is the one owned by Mrs Silvers, who has been mentioned before. So all is now clear. St Cuthberts Church is no longer there, of course, but I do remember that there was a Church Hall behind it, in Cuthbert Street, and while I was in my final year at Dudley Road School (1953), the top two classes from there were held in the church hall for some reason. I was there in the class run by Mr Moss, who has also been mentioned before. I found him to be a very good teacher and it was only through his efforts that I managed to pass my 11-plus and go on to George Dixon Grammar School. My name is Stanley Williamson. I lived at no. 4 Peel Gardens in Peel Street from when I was born in 1932 until I moved to Bedford in 1959. 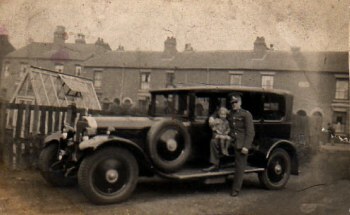 My father, William Williamson, owned a taxi cab and I was the youngest of 10 children, 5 girls and 5 boys. Sadly only three of us are here today, two sisters, Joan and Dorothy and myself. My memories of wartime Winson Green; the air raids, bombs and incendiaries exploding in Aberdeen and Peel Street, not being able to go to school due to no heating caused by a lack of fuel for the boilers and having lessons given by the local vicar in his house in Lansdowne Street, by Evans Coal Yard. Calling in at Mr. and Mrs. Silver’s sweet shop buying chocolate covered dates (not rationed) and that strange machine filled with water. They would put some colourant in a glass filled with water from the machine and inject a gas (co2? ), I think it was called Fanta (Vantas). As young lads we would gather outside a fish & chip shop next to the Cottage of Content pub in Norman Street. The lady would give us a small bag of what we called scratching's, in fact they were bits of batter from the fish fryer. Happy days! I think we were happy mainly because we were all the same as each other. None of us really had much, we played together girls and boys, games like hopscotch, skipping, hide & seek all taking place in the street. No cars, just horse & carts. Sometimes we played late into the night, and it never seemed to get dark in the summer. The clocks were put forward two hours; it did make a difference. It really was inconceivable how our parents managed foodwise considering the meagre rations available, but we were happy and we survived. Living in Winson Green, going to Foundary Road and Handsworth New Road schools, I suppose it was inevitable that I would join the prison service. I was a prison officer for some thirty years, and now at 76 years of age, I have been retired eighteen years. I was born at 70 Peel Street, Mr and Mrs Silvers had the shop next door. Dad use to drink at the OAK TAVERN and Mom at the QUEEN ARMS in Aberdeen Street. I would like to be able to get some old photos of Peel Street and of the old Winson Green prison. My brother my sister and I use to go dancing at the Smiths Arms every week. Now I live 12 thousand miles away, in Wellington, the capital of New Zealand, and we look out over the sea, How the world has changed and not for the better I'm sorry to say. If you can help me I would be forever grateful. I thought your "Ode to Winson Green is terrific and your web sight fantastic. PEEL STREET 09/10/07 I wonder if anyone has any knowledge of some wartime friends who lived in Peel Street their surname was Evans. They were Minnie, Betty and Dennis Evans they were also members of the C.L.B. at Bishop Latimers Church. and had a lot of fun with the kids. I didn't think about people being economically poor. Does any know my Nan Annie Kirsch she lived in Peel Street a long time. Irish Girls 19yr/20yrs boarded with her. Poor girls I could hear them crying in their beds, they were so lonely and homesick. I can still see the Rag Man coming down the street with his horse and the kids scooping up the manure for the Victory gardens that people still had after the war. The bombed out buildings at the top of the street. Thanks for this Brilliant site.I am sure putting it all together was a lot of work. VE party in PEEL STREET, 1945. 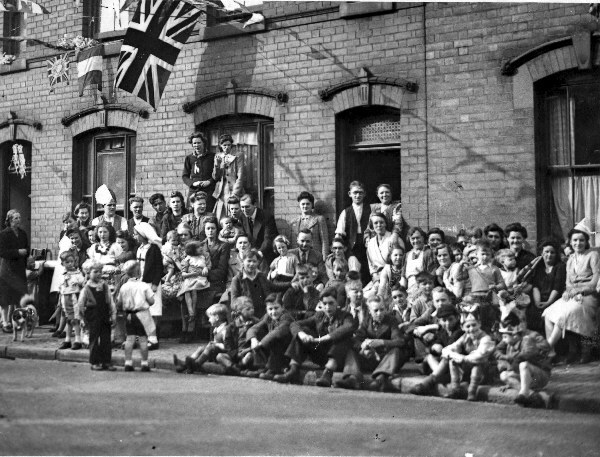 27/05/08 The VE party in PEEL STREET, 1945. The lady standing in the doorway is Mrs TONKS so this would be about 92 or 94 Peel Street. Mrs Tonks later took over the shop lower down from Mrs SILVERS, who moved into this house in a swap. The gent leaning forward from the window is the local MP, Geoffrey LLOYD and on his right is my mother Edith FIELD, holding my younger brother Stan (b.1944). They are trying to attract the attention of my other brother Tony, standing with his back to the camera. Next to him is Bobby (?) PRENTICE. I am apparently not there as someone had taken me to the toilet!! The two ladies on the left next to the chap with the funny hat are my aunt Dorothy CHITTOCK and grandmother Florence EADS in front of her. The two ladies high up in the centre are Mrs HARRISON and Mrs PARKER. Mrs LLOYD is in front of Mrs Tonks and 3rd in from the right is Mrs MEAKIN. I am sure some of the youngsters will recognise themselves. 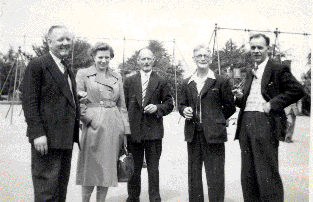 Myself (left) and brothers Stan and Tony, with our grandparents Floss and Billy Eads who lived at 2/69 Peel Street. Of equal interest is the caravan, which dad built from an old single-decker bus at Woolleys coalyard in Norman Street during 1948-49. 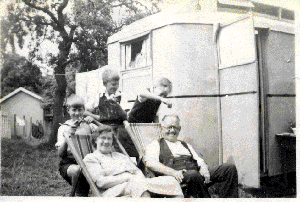 It was then towed behind Mr Woolley's American 'Diamond T' lorry, with us sitting in the open back of the lorry, all the way to Bewdley where we kept it for many years. Oh happy days! But I do remember that we would walk for miles in Bewdley, on our own, often out for most of the day- and be perfectly safe. What has changed since then? I have just found this site and it is fascinating. We lived at 112 Peel Street from when my parents Edith (nee Eads, born 1919 and formerly of 2 back 69 Peel St), and father Ernie FIELD (born 1913 at 84 Peel St.), moved into 112 when they married in 1938 and stayed there until 1961, when we all moved to Harborne. They had 3 sons- Tony (b.1939), myself Roger (b.1941) and Stan (b.1943). Edie is still with us and I will now pick her brains, and store of photographs, for more information. We seem to have colonised Peel Street- my grandparents Bill and Florence Eads living at 2/ 69, uncle Bert and great grandmother at 67; Uncle Gerald and Aunt Dorothy Chittock with cousins Diane and Stephen at 2 back 71; the Field family home at 84 (my paternal grandfather owned part of the factory behind 84, but died young and it went with him). There was anoither aunt and uncle, Doris and Sam Binning with cousin Joyce for a while in Little Peel St.
We were almost opposite the 'Sir Robert Peel' pub and Peel Gardens, where the house had large gardens but at the front of the houses. I recall having friends there, Michael CORLEY (good footballer) and John and Keith CLEWLEY. Another friend was John CLAWLEY who lived on the corner of Peel St with Lansdowne St, opposite the pub. My brother Tony married Mary EDWARDS, who lived at the cul-de-sac end of Lansdowne St. and they now live in Worcester. I did start school at Foundry Road Infants, 1946 I suppose, but mum moved us to Dudley Road Infants when a youngster was drowned in the canal in Winson Green Road, and of course we were walking past it four times a day to get to school. We all 3 passed our 11 plus, Tony went to James Watt Tech in Smethwick, Stan and I went to George Dixon Grammar. How did our parents afford it?? It was a real struggle I can tell you. Just a couple of points from reading the site- Mason's the barber mentioned by Paul Holmes was actually just inside Heath St, turning left from Winson Green Road. We were all regulars there. And there was an enquiry in 2003 from a Linda Richardson nee DAGLESS under Norman St. I did know a girl named Dagless from there, but am sure her name was Joyce. Sister, maybe? I will be back with some photographs before long. Hi love the site. I used to live at 4 back of 71 Peel Street from 1962 to 1973 then 30 Factory Road right next to the Black Eagle pub. My best friend's dad ran the Old Engine pub just round the corner on Park Road. Maurice Jenkings and my mate's dad up the road ran the Wonder Vaults 39 Benson Rd the Tapleys. Great times. My family lived in Peel Street number 27, between the years 1965 to 1969 aprox, we had moved from Icknield port road a back to back house, and was so excited that we had our own yard to play in, gosh what memories that come back. I was born and lived at 40 Peel Street from 1955 to 1966. I went to Foundry Road from 1960 to '66 and then went to Lordswood with a few other Foundry Roaders. One of my closest friends is a mate I met on the first day at Foundry Road 43 years ago! We went through Foundry Road and both went to Lordswood in '66. His Mom owned a shop on the corner of Victor Road and Lodge Road. Her name was Maureen Kyte. We used to have our Foundry Raod school sports day at Black Patch Park. I can remember it very clearly. I used to live in Peel Street. Brother Terry Moody. Went to Handsworth New Road School. Keen member of the 39th Coy Boys Brigade.Anyone remember us Moodies? I read the message from B Smith whose husband's grandfather was born at 82 Peel St in 1881. My great grandmother (Hannah Smart) was born at the same address in 1880. There were two families at that address on the 1881 Census (SMART and WAIN). I have tried to reply to the email address supplied but it was undelivered. If B Smith would contact me, or anyone else with information, I would be very grateful. Back of 68 PEEL STREET was where my Gran and Grandad Giles, bought up twelve children in a two bedroomed back to back house. Such large families were, of course quite the norm in those days, as indeed were the cramped conditions in which they lived. I once asked my mother how 2 adults twelve kids, and three foster kids after my gran's sister died, could live in such a small space. She told me that to get everybody fed, they would sit one per stair starting with the youngest on the lowest stair rising to the eldest at the top, and pass the bowls of food up the stairs! Hi, I don't know why but after being a surfer on the Internet for about 10 years I decided to search on the place where I used to live - Winson Green - and here we are, well done. The Green was a great place but we didn't know that till we where forced to move due to redevelopment in the late 60s early 70s. I think I was 12 when we moved out of No.2 back of 69 Peel St. Having moved there from Bernus St Aston when I five. need to teach her son to stand up himself if he get beaten up by a five year old. happened to her and her sisters. I went to Foundery Rd & Hansworth New Rd Schools, sad thing is almost all of my class decided to NOT pass their 11+ so we didn't have to go to a posh school. Well must stop somewhere so here it is. Dave. George, Arthur, and at the front Charlie Giles. Taken about 1920. George Arthur Charlie Three of my uncle's. 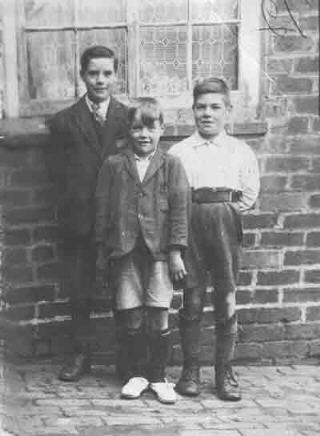 From the left: George, Arthur, and at the front Charlie Giles. Taken about 1920.The pencil written inscription on the back of the photo reads "Back of 68 Peel St" Winson Green"
PEEL STREET. Your site has bought back so many memories for my Husband.